“There are three ducks in a lake”, says a soft voice and I duly imagine three fluffy yellow ducks paddling in a lake. “Ducks don’t get wet. They have a special coating on their feathers. But if it was a chicken, if you threw a chicken into a bath, it would sink”. I cannot help but smile at this visual but there is a point to this somewhat surreal exercise. It’s the first image or series of stories designed to achieve goals I had written down, something every person undergoing hypnotherapy is encouraged to do. It’s a surprising and stimulating experience, and whether you choose to embrace or reject the concept, it’s a powerful way of seeing one’s own mind once you realise what it’s trying to do. Its success rate in dealing with problems ranging from weight loss to depression, confidence issues, aiding recovery from illness and changing habits, is debated. But by the end of the session I am stunned to learn something about myself that I had not considered. Like a lot of people I had thought of myself as impervious to hypnosis. That I, an independent, strong-willed individual, would not be susceptible to such gullible mind tricks. But Erin Lee, the certified hypnotherapist whose voice starts this article, is quick to dispel this idea. “That’s one of the common misconceptions”, says Lee. “Some people are more susceptible to hypnosis than others. Some people believe they can’t be hypnotized. But, in fact, you can. Hypnosis is an everyday, natural occurrence. Everyone can go in or out of hypnosis. For example, when you’re daydreaming or absorbed in a book or movie and you can’t hear your mum calling out to you. That is a form of self-hypnosis”. I mention the instance of when I’m driving or playing a video game of periods in time when I don’t realise what I’m doing, that, after, I had no memory of doing something seemingly quite complicated. “Yes, that’s called ‘highway hypnosis’. It’s a natural state of mind. But these forms of self-hypnosis they don’t usually come with therapeutic goals, which is the difference with hypnotherapy. It’s to work towards a specific, positive goal”. Erin Lee, 30, is from Singapore and has been in Beijing for two years. Before that she worked in the communications industry for almost a decade. She still does PR work but four years ago she discovered hypnotherapy. “I was at a low period in my life and had really low confidence. I had a great job, a lot of achievements in my work, but I was basically unhappy. I had long hours and I didn’t know what I was slogging so hard for”. She then went through hypnotherapy herself and took an active interest in it, consuming books on the subject. She started official training last year and has since become certified by the American National Guild of Hypnotists, among other bodies. I come into a state where my eyes rest behind my eyelids and my mind is in that pleasant place where it’s unselfconscious. I am aware but tranquil. My mind is calm when it is usually overactive. It’s a nice sensation. I could open my eyes and stop all of this at once – but I don’t want to. Next, it’s the visualization – “imagine a nice place”, and I imagine a field of golden wheat softly blowing in the breeze. Before the session I had written down my goals for Erin. I had wanted to have better self-esteem, be less self-conscious and to be in a better position to deal with hurtful things said by people in the past. Standard-issue issues. I wander around my ‘nice place’ and then there’s a lake. Cue the ducks. There is a leaf, a perfectly-shaped green leaf, on which is a droplet of water. Ducks don’t get wet, even in the rain. The droplet of water is like a bad word. It falls on the duck and it rolls right off. The bad things people say is like water off a duck’s back. Another scene: there’s a girl in a class. This metaphor deals with how you deal with people’s judgments and perceptions of you. It’s interesting that Erin uses a girl. In the form I had filled in it asked to list some of my favourite things. I had mentioned one of my best female buddies and my sister. Perhaps I find it easier to empathize with girls. The end comes in the form of a pebble that encapsulates all the messages that were communicated. When the pebble hits the bottom of the lake, the messages will have been taken in. She anchors the feeling to the colour red. When I see red colours, she says, I will remember these feelings. When I ‘wake’, I feel a rare calmness. Lee asks me about the experience. I tell her that at times I couldn’t hear what she was saying, that I was ‘somewhere else’ (it felt a little like dozing off), but that I would…’come back’ (eyes still closed). She tells me that that was hypnosis. I had been hypnotized. In those moments when I couldn’t hear. My subconscious mind, she says, however, was taking it in. That’s how hypnosis works. After the official session, she shows me a pendulum; yes it’s not a myth, they are still used, although mostly for children, who can find it difficult to concentrate. I hold the pendulum and she asks me to move it with my mind. It does, and it genuinely feels like I am controlling it with my mind. But, alas, I know how it works and I tell her: “It’s just suggestion, isn’t it? I suppose once you know how it works, it loses some of the magic”. “Yes”, she replies, “a popular saying among hypnotists is: ‘All forms of hypnosis are self-hypnosis'”. I realise I am just as susceptible as everyone else. Of course, I could choose not to be suggestible. But that choice, an active, almost willful exercise in mind management is not something we do all the time, perhaps not even often. Whether it’s an advertisement, social media, or a passing comment made by a friend or relative, we are all prone to external influences. Hypnosis could strengthen the subconscious to be stronger against the negative feedback, to fortify the mental walls. But I have a hunch that its greater power, its true effect, is in training and exercising the conscious mind to be more disciplined; to be better stewards of our own thoughts and feelings. When I return home I always pass a stallholder that I usually stop to chat to. She’s just dyed a streak of her hair a lovely shade of red. It looks nice, and I smile. 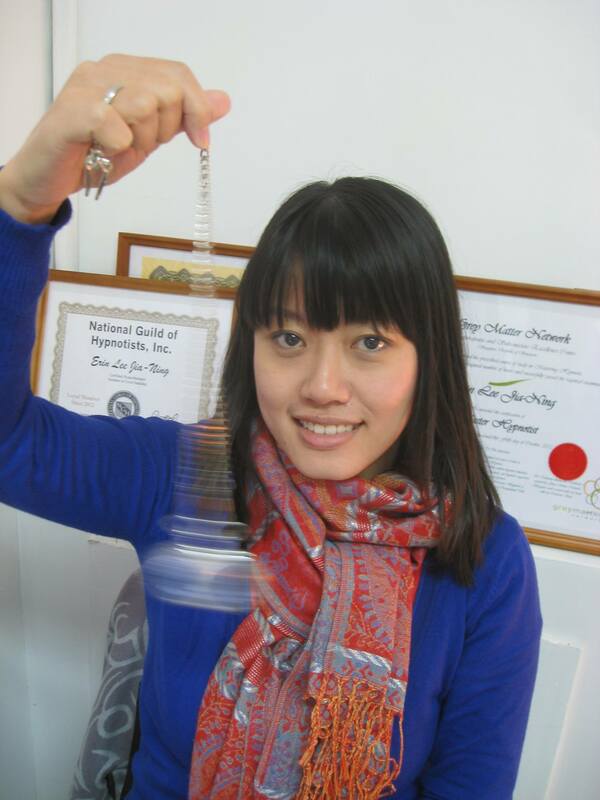 Disclosure: I went to get hypnotized in December 2012, to tie in with World Hypnosis Day (4th January). This article was originally filed for a local Beijing magazine. No money exchanged hands between Erin, the magazine or I.